A learning event bringing together SCN members to hear about some of the tools, resources and techniques which support co-production. This SCN learning event attracted more than 45 attendees from across sectors to be involved in practical workshops run by the people and organisations who have develop and used tools as part of their work. Colleagues from People Powered Health and Wellbeing, Independent Living in Scotland (ILIS), Governance International, East Dunbartonshire Council, Iriss, NEF and SCDC shared their experiences and expertise with attendees in the full day session. This report acts as an overview of the day, as well as detailing some of tools and techniques highlighted in the workshops. We'd like to thank all of the facilitators who contributed their time and experience to make the day possible - thank you! David Reilly, Development Manager at SCDC, introduced the day and set the scene for the workshops. With three in the morning and three in the afternoon attendees had to make the difficult choice of picking just two! Governance International is a Birmingham-based organisation that delivers tools, training and research around public services, participation and co-production. They have been involved in the Scottish Co-production Network and were featured in the 2015 resource ‘Co-production – how we make a difference together’ with the Co-production Star Toolkit. The day’s workshop was centred around this toolkit, with Governance International’s Elke Loeffler and Paula Brown from East Dunbartonshire Council speaking about how they developed and used the tool. Elke took attendees through the Co-production Star: the toolkit enables organisations commissioning and delivering public services and their local communities to examine where co-production sits in the context of their communities. Grow It – within and beyond the organisation and local community. The Four Co’s of co-production as part of the Star demonstrate the ways in which a co-productive approach can be integrated into the way services are run. Co-commissioning is about service commissioners working with people who use services and local communities in the prioritisation and planning of public services. Co-design is about service providers and citizens redesigning public services to improve outcomes and reduce costs. Co-assessment is about public service providers working with citizens as evaluators of public service quality and outcomes. You can read a full summary of the Co-production Star here. From here, Paula from East Dunbartonshire Council told attendees about her work implementing the Co-production Star as part of the PRESENT project. PRESENT, which is a joint initiative of East Dunbartonshire Council, the local Dementia Network, the Joint Improvement Team and Governance International - it aims at establishing a new type of collaboration between people living with dementia and public services in East Dunbartonshire, based on co-production approaches and values. The project used the five stages of the Co-production Star to develop a series of projects which brought people with dementia together for walks, community cafes and other activities. During the workshop, Paula detailed how pupils from Bishopsbriggs Academy helped to launch a new community café in a local care home, supported by senior school pupils. You can read the full PRESENT case study here. It then takes practitioners through the process of identifying their score, reflecting on how it can be improved and how the framework itself can be improved, for example by asking the people engaged in the service to use it. Participants started by looking at the 6 key co-production principles that were described in the above. Only a couple of workshop participants had heard of this toolkit but most recognised and supported the principles involved and were able to make connections to other related user involvement/empowerment policies and practice. Then attendees broke into small groups of 2-4 participants to look at the 3 “pairs” of principles. The suggestion was made for 3 separate groups to each focus in depth on a single pair and share feedback but participants wanted to discuss all the principles and work their way through the toolkit. We therefore discussed all six in the small groups. Participants found that they needed to talk first and foremost about what they were doing and the ways in which this was co-productive. This enabled them get to know other groups members and find out what they were doing before getting into a discussion about the toolkit in its own right. Embedding the principles is fundamental if co-production is to be real and meaningful. The challenge is to give them practical meaning and effect. Engagement and involvement isn’t quite the same thing as co-production. They may be starting points or foundations for professional staff or organisations to have a dialogue with people but are a long way off being a relationship that is truly equal. Understanding the context in which staff work is important – this affects the way in which outcomes are set and indeed whose outcomes are paramount. Other pressures also affect whether co-production can happen e.g. time pressures on staff and lack of resources to properly involve sand support people. Its simplicity is attractive to some but for others it lacked something more substantive to accompany it or act as a pre-amble. One of two participants suggested it might benefit from being linked with or underpinned by a broader theory of change or logic model. Some participants questioned how well it would sit alongside the Governance International Co-production “Star” and thought that looking at both toolkits together would be helpful. Most felt that the scoring instructions were vague and didn’t actually add anything to the debate or their results/conclusions. You can view the toolkit here. People Powered Health and Wellbeing is a programme led by The ALLIANCE which works to further people’s influence over their own health and wellbeing and contribute to the design, delivery and improvement of support and services. Lisa Curtice Programme Director of PPHW and Jackie Doe, Project Manager at Perth and Kinross Healthy Communities Collaborative facilitated this session. Lisa and Jackie took participants through asset mapping - a co-production approach where communities identify and collect information about local resources, assets and strengths. Asset mapping is used to identify what exists within specific localities as well communities of interest and different groups. The key to asset mapping is recognising the contribution that people with lived experience make and how their skills can be utilised. To start things of, participants came together as a group by using the “Hello, my name is…” approach popularised by a campaign led by Dr Kate Granger. This was a great way for participants to share something of our whole self by telling each other about something I am passionate about, something you may not know about me, where I work or live and what keeps me well in my community. Sharing the results in groups and finding common bonds led nicely into asset mapping, which took up the rump of the workshop. This was very much a practical exercise which challenged attendees to map and design a community that keeps us well. Whilst doing this, what really mattered were the conversations going on and the links we made. There were lots of learning points about using asset mapping in practice, usually with communities of place. Because jargon is off-putting, not to call it asset mapping; instead, invite people to “come together to learn and share”. Keep it simple and cheap; fancy material isn’t needed. A free hall, recycled material can do the trick. All you need is a facilitator and someone else to record the discussions. Focus on what is in the community (and get some quick wins on spreading knowledge amongst the group, encouraging buddying). Ask what is missing; asking the question of the group: do you want to plug that gap? Can we co-produce the answer? Well Connected Perth and Kinross have made their Well Connected Toolkit available online, with plans for sessions ranging from one hour to full day. You can read more about PPHW and Asset Mapping here. The Independent Living in Scotland project has been set up to support the progression of disabled people’s human rights. ILIS raises awareness of disabled people’s independent living and equality and human rights among professionals, policy and decisions makers and politicians. ILIS works has part of the Scottish Government’s initiative to deliver equality and human rights for disabled people in Scotland. Heather Fiskin, Project Manager at ILIS took the day’s session. ‘All together now’ is guidance for disabled people and their organisations which explains what co-production is and how to make it successful. Written by disabled people it gives guidance on how co-production can be used to start working with service providers such as local authorities, NHS boards and others bodies. It’s designed for disabled people, but also their co-production partners too. The toolkit is highly practical that looks at the challenges and opportunities for disabled people working together with service providers. It features things like checklists and practicalities around access requirements and communication methods. Participants kicked off the session by stating together ‘Nothing about us without us’ which was a great way to warm up and think about how challenging it can be to speak up and have your voice heard collectively. Participants admitted that this made them feel uncomfortable, which Heather linked to the importance of being honest about our feelings. Participants then took part in a role play exercise of disabled people who use a day care centre meeting with council representatives – working through a scenario of the proposed closure of a day care centre due to council budget cuts. The challenge was to decide how everyone would work together to identify a shared outcome and potential solutions. It was useful to be challenged to consider a real life scenario and how the ILIS toolkit could be applied. The safety of the role play scenario allowed participants to respond as they would imagine each of the groups to do so – and it was interesting how people struggled to let go of assumptions around power, responsibility and capacities of each of the groups in the scenario. This gave participants an insight into the importance of being clear on what is being co-produced; have decisions already been made? What exactly, therefor, are we co-producing? Are we co-producing at all? The ILIS guidance offers check lists to use when planning or review meetings that help you ask yourself the question – are we really co-producing? Read the All together Now report here. What makes a good co-production case study? A key part of the Scottish Co-production Network’s role is spreading good practice, and learning and finding ways to evidence co-production in different settings. 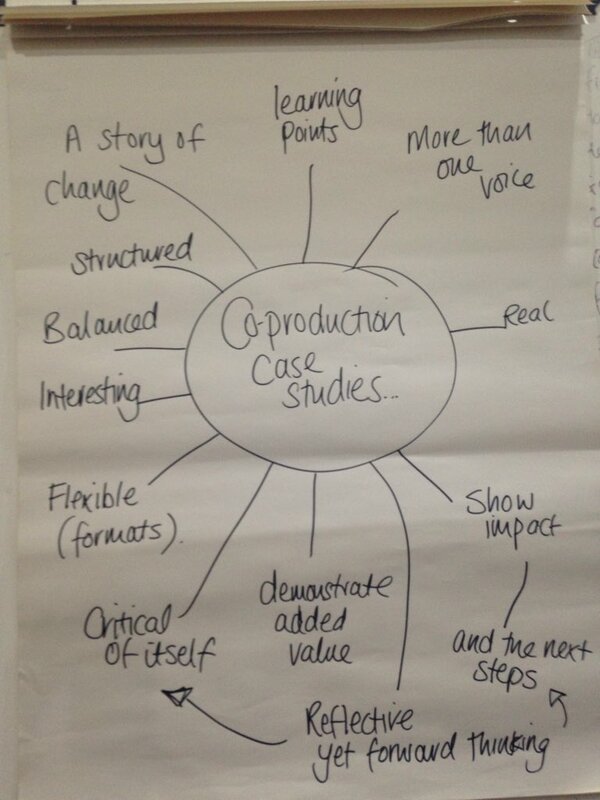 Olivia Hanley, Development Manager at the Scottish Community Development Centre (which manages the Network) shared some of her experiences in developing case studies and asked participants: what makes a good co-production case study? Case studies are a key part of evidencing the work that organisations carry out. For co-production, there’s an added challenge that sometimes it’s hard to identify ‘co-production in action’. There’s less emphasis on quantitative data or a checklist, so a well formed case study makes sure evidences the process but also truly captures the learning and contribution of everyone involved. that they should tell the story and show the impact of the work – importantly how will the voices of the service users/community/ all those involved be best captured? Important to be clear on why and how the example is co-production – using eg toolkits such as the NEF core values or ILIS checklist can be useful. Or identifying them as co-design/ co-commissioning etc. Participants then took part in an Ideas Log exercise to share their own perspectives on ‘What makes a good coproduction case study?’ They went round the room sharing ideas and adding them until they had a list then identified the idea that stood out the most to them. These ideas were captured and used these in the mini case studies exercise. For this exercise, participants worked together in small groups to mock up a case study. They chose real examples from their own work and shared the stories with other participants who helped them unpick how best to capture it in a case study. One group used a video interview format, with an audio clip from participants in the project which was an example of men’s group who designed their own day activities and formed a committee for their group. Another group worked up a visual of a web page designed to share the learning from a young persons’ project. The third group worked through a live example of an older persons’ day centre and activities and talked about how a live case study could support the group of older people to identify what needs to change. Read some SCN case studies here. Iriss is an organisation which looks to support innovation and improvement in the social services sector. They work with policy makers and practitioners to doing things differently' and develop skills, learning and resources to create more effective practice. Iriss were part of the ‘Co-production – how make a difference together’ resource where their Hospital to Home project was detailed. Fiona Munro, Project Manager for Hospital to Home, led the day’s session. Participants were initially taken through some of the background and context around the Hospital to Home project. This project worked with health and social care practitioners, older people, their families and informal carers to identify and improve care pathways from hospital to home and enable a more positive experience for all during this transition. You can read more here. Along with this, the Iriss Imagining the Future work was used to show how different techniques, (including using Lego!) could be used to help visualise the future of services. Fiona introduced the session by trying to embody one of the key principles of the Hospital to Home work – that people shouldn’t be defined as practitioners or service users. Workshop attendees were asked to introduce themselves not with their job title or organisation, but with an object that they had on them – from jewellery to fruit, people told the group a little about themselves through the item. This helped break down the barriers between attendees and also gave people a chance to express themselves as people. This instantly broke down barriers - everyone in the group was a person with shared values and no longer a group of practitioners and older people. Throughout the following sessions the group would reflect on this and how it had made them feel more comfortable. Person-centred, progressive, localism, collaborative, creative, motivated, hope, shared values, open-minded, sense of belonging, participatory, self- motivated, personal responsibility, citizenship. Community-based, holistic, assets based, non-judgemental, mutual respect, proactive, flexible, adaptable services, positive ageing, resilient, collaborative learning, cross sector. This vision is part of IRISS’ ‘Imagining the Future’ work, where different scenarios have been developed to show what is possible in the future of services: their design, implementation and the roles service users and professionals may take. To think about this ‘New Normal World’, attendees were given boards which represented local communities along with cards which represent scenarios which may have occurred. Then, using Lego and Playmobil figures attendees built, positioned and imagined how services would operate based on the characteristics above. This process was not only a fun way to creatively think about the potential for the ‘New Normal World’, but the map and the physical objects also helped to show how services interacted. Seeing on the boards the local community transport initiative along with the hospital meant you developed one service to compliment the other, for example. You can download the toolkit for this workshop here. Made it to #copro2015 - thank you for waiting on the Glasgow delegation on the train after the cancelled one! What was the most useful part of the day and why? "Co-production star - will use it some future training"
"The workshops and connecting with colleagues"
"Exploring the tools available and hearing about networking opportunities to share good practice"
What was the least useful part of the event and why? "It could have been longer!" "Could only go to two workshops so missed out on the other tools"
"How to evidence within a co-production model"
"Greater understanding of co-production in practice"
"Iriss co-pro tools - can see a use for all of these"
"Ensure all your stakeholders are fully consulted and involved - not just those with the loudest voice"
"Use the NEF self-assesmment tool with public sector partners"
"I would like to have attended more workshops"
"Really enjoyable - good facilitators"